I’m a extremely busy person and I take my dogs with me to work several days every week. Recently I bought a new car and even though I love my fur babies I don’t want them to scratch or tear my upholstery with their nails. I also don’t want them tracking mud and dirt all over my seats too. So I started researching options for protecting my seats when Matilda and Finnegan (my German shepherds) are in the car with me. 4Knines makes a very stylish back seat cover for SUVs. I have a Dodge Journey SXT with black interior so decided to try the regular size black cover. 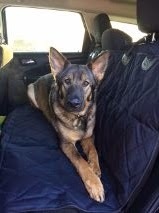 When I first took the Dog Seat Cover with the Best Nonslip Rubber Backing and Seat Anchors for Cars Trucks and SUVs out of the package I was a little overwhelmed. I’m only 5’2″ and the back seat cover was big enough to cover me up! I had made sure my seat was clear and laid out the covering. It literally took less than 5 minutes to install it. First, I buckled the straps around the headrest and tighten them up so it was flush with the headrest. Next I pushed the anchors in between the seats. And lastly I adjusted the cover to make sure every inch of my backseat was covered. Now I was concerned if it would stay in place when Matilda jumped in the car so I called her over. She promptly jumped in and laid down on the seat. She seamed to enjoy the cover and it did not move when she was walking around or getting in and out of the car. I really appreciate the 4Knines dog seat cover with nonslip rubber backing and seat anchors because it was very simple to install, installed in less than 5 minutes, covered and protected my back seat, did not move when my dog jumped in the car, out of the car or walked on the seat, has anchors to hold it in place and I am able to access my seat belts if someone where to be back there with them. If you are looking for a stylish and protective cover for you backseat that your dog will enjoy then I highly suggest heading over here to order one today. It comes in black, grey or tan and in 2 sizes so you are sure to find the size you need and the color you want. I received 4KninesDog Seat Cover with the Best Nonslip Rubber Backing and Seat Anchors for Cars Trucks and SUVs complimentary for evaluation purposes. Regardless, all opinions expressed are still 100% my own. I am disclosing this in accordance with Federal Trade Commission 16 CFR, Part 255 Guides Concerning the Use of Endorsement and Testimonials in Advertising.